Home Local News WATCH! PRES. DUTERTE’S ARRIVAL IN MOSCOW, RUSSIA, NAMANGHA SA GALING NG MGA RUSONG SUNDALO. WATCH! PRES. 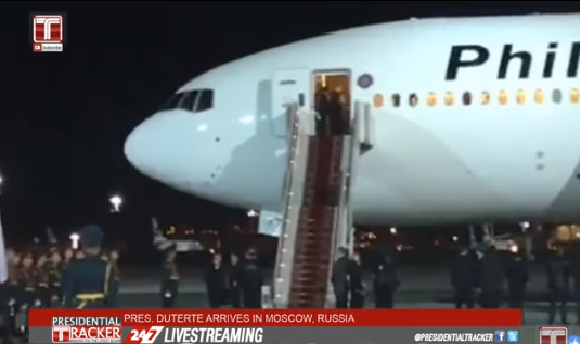 DUTERTE’S ARRIVAL IN MOSCOW, RUSSIA, NAMANGHA SA GALING NG MGA RUSONG SUNDALO. President Duterte will visit Moscow and St. Petersburg where President Putin was born.Several bilateral deals are expected to be signed during the trip, including one on defense cooperation. Russian leaders previously told President Duterte that they’re ready to help in the AFP’s modernization program. The visit could be a venue to jumpstart military procurement deals.